Coastal redwoods at Muir Woods National Monument, CA. Photo © Keisha E. McKenzie. All rights reserved. If you’re ever near San Francisco, CA, take a trek north to Mill Valley. Spend a couple of hours walking around these thousand-year-old trees and see if you don’t leave the grounds with clearer lungs and a fresh perspective on time. 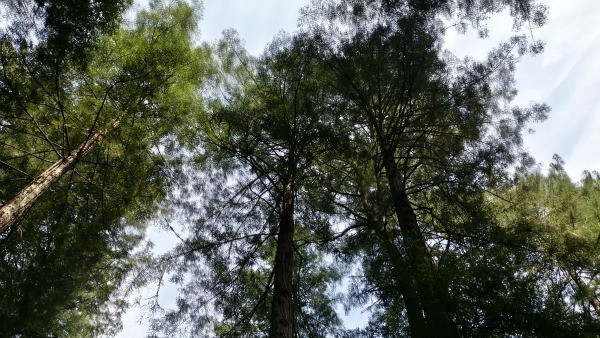 I brought back a bag of sequoia seeds in a can when I visited Muir Woods last spring. I planted them dutifully, watered them, stored them in the fridge, shocked them warm in their plastic greenhouse, and waited. Two seeds sprouted. They’ve been about two inches long since November. “What if they’re dead?” I asked last night. Beautiful things sometimes take thousands of years to grow. Beautiful things can also seem to spring up overnight, like the cherry blossoms I photographed on Christmas Day that arrived on the region’s trees four months early. There are reasons they bloomed out of season this year: in a complex system, all outcomes have causes, and many outcomes have several. But from where we stand, from our tiny vantage point and limited perspective, some outcomes seem wondrous. At Muir Woods I walked among trees older than seven of my family’s generations. Some of the trees were forest fire survivors; others had survived world wars and cold war; and all of them were threatened by anthropogenic climate change—the risk of a few degrees and the loss of the cool humidity that has helped these tree guardians to thrive for so long. We take our whole lives to grow up, but the distance between our state yesterday and our state today isn’t large enough for us to notice the difference. Our societies seem to grow even more slowly than we do, and that makes it hard to motivate substantive change. Sometimes it feels as if our promising world is two inches tall or dead altogether, but there are still green leaves on the branches. The world is in motion, and things do change. But the process is too slow and we’re too small in the context of change to sense it. We have the ability to imagine our world regardless, to re-envision and reshape the way things are and the social world that we came, found, and sometimes take for granted. We’re not big enough, don’t live long enough, and don’t perceive widely enough to know all causes for an outcome. Nor can we guarantee the results of what we’ve contributed or limit ahead how much time the seeds we’ve planted and nourished will take to yield results. We can guess. We can model and project. We can hope. Nothing about life in this quadrant of space promises us any long-term outcome no matter how anxiously we hover over what should be and isn’t yet. We’re not promised sure victory or an inevitable arc. All we’re promised, as Krishna tells Arjuna, and Steven Pressfield tells us, is the intrinsic reward of our daily work and the distance and time to grow between one state and the next. Our job is to press for a world we’ve never had, and to inspire every generation that follows us to keep pressing until that world is real. Beautiful things sometimes take thousands of years to grow, and the chance we have to nourish them is its own reward.